What is Good: We finally know the gender! We finally know the gender! Yesterday was a very special day for us! I had my 20 week ultrasound. We know the gender! 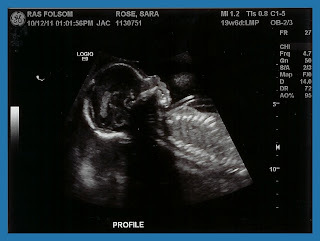 What an incredible miracle to be able to see my baby's heart beating, 10 tiny toes wiggle and hands waving. The hands were certainly not waving at us though! My son kept waving his hands to cover his little parts, it was hilarious! There was no doubt he's a boy! Now we can pick out a name. I was so glad to be able to share this time with family, thank you for being there! As we were leaving Isaac started to get teary eyed and grew concerned that we weren't bringing baby brother home with us now, it broke my heart to see how sad he was that we still have a few months to meet him in real life! 20 weeks can't come soon enough, I can hardly wait to hold my little blessing! God is good!